We are in the middle of a sermon series entitled “The Why’s and Wonders of Worship”, addressing specifically why we do what we do in worship. 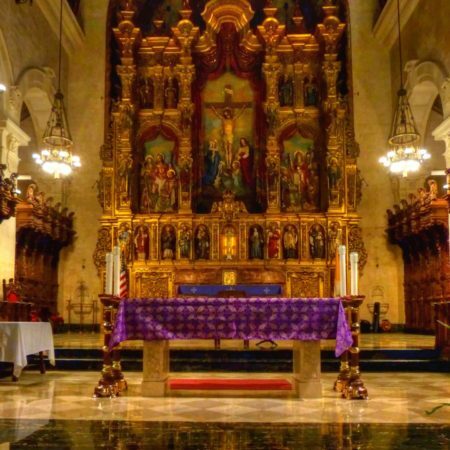 And this morning, I would like to look at where we do worship; in particular, the significance of the “sanctuary.” Sanctuaries or sacred places, are often built on holy sites. Stonehenge in England was sacred space for the Druids. They built it in 3000 B.C.E.. It was used as a place of worshiping and observing stars, a place to perform rituals and ceremonies. It is considered to have been a sort of Druid temple. The most holy place on earth for the Buddhist is Bodh Gaya. It is believed that this is the place where Buddha sat under a bodhi tree and gained enlightenment. Thousands of pilgrims flock to the site to try to attain even a pinch of the wisdom that Buddha is said to have gained there. For the Hindus, one of the most sacred sites is the Golden Temple along the Ganges River. The Ganges River was said to be created when Vishnu, a Hindu god, took two steps to cross the universe. The Ganges is considered to be the holiest river of any religion. Millions of Hindu take a dip in the Ganges believing it will wipe away all sin and heal all sickness. When someone dies Hindus cremate the body and scatter the ashes on the river to give it as an offering to the gods. The holiest site for the Muslim is the Great Mosque of Mecca. Mecca is the birthplace of the prophet Mohammed. Mecca is designated as the holy city of Islam and is the direction in which all Muslims are to offer their prayers. Mecca is also the required sited for Muslims to pilgrimage. The Great Mosque of Mecca is home to the Ka’bah which is believed to be the first house built for humanity to worship Allah. Built by Abraham and his son Ishmael. Interestingly, the third holiest place for the Muslim is the Temple Mount in Jerusalem. It is believed to be the place where Mohammed ascended into heaven to speak to Allah. But for the Jews, the Temple Mount represents the holiest site on the entire planet. Jewish tradition holds that that Adam was created there. The binding of Isaac occurred there. The first and second Holy Temples stood on this very ground. This is a replica of King Solomon’s Temple. The sacred building housed the Ark of the Covenant where the 10 commandments were stored. The Ark of the Covenant represented the presence of God. Inside we see the veil separating the Holy place from the Holy of Holies. The high priest would enter into the Holy of Holies once a year – on the Day of Atonement, Yom Kippor, which the Jews just observed this past week. The high priest in ancient times would sprinkle blood on the Mercy Seat on the Day of Atonement as an act of atoning for the sins of the people. The Mercy Seat was the golden lid placed on top of the Ark of the Covenant. After the destruction of the Jewish Temple Jews continued to journey to the Temple Mount area to weep over the destruction of their holy site. Traditional Jewish law states that “no man nor woman should set foot in the entire area of the Temple Mount.” Why? Because it is where the Holy of Holies once resided and Jews do not wish to tread on sacred ground. The Western Wall, the last standing retaining wall of the Temple Mount is the closest to the Mount that Jews are traditionally permitted to pray. Of course, Jerusalem is a sacred place for Christians, too – many Christian walk the Via Dolorosa – walking where Jesus walked – from the room of the Last Supper to the Garden of Gethsemane to Golgotha, where Jesus was crucified. All religions have sacred space. Sacred space is a place that connects humanity to the holy. We yearn deeply to connect with the Divine. At Redlands United Church of Christ, with our emphasis on environmental stewardship, we believe that all land is holy. We have created a sacred space, a sanctuary, to reflect that belief. This Sanctuary was inspired by the work of E. Fay Jones who was an apprentice to Frank Lloyd Wright. They both employed a style that not only draws inspiration from nature but blends seamlessly into natural surroundings. Here is some of the work that these architects created. Some of you who went to the Silent Retreat in Palos Verdes last summer will recognize this chapel – the Wayfarer’s Chapel created by Frank Lloyd Wright. All of these glass chapels in nature are utterly breathtaking. While we could not afford Frank Lloyd Wright or E. Fay Jones as our architects, we did want to create a sanctuary that blends seamlessly into natural surroundings. And this is what we have. You will also note that at the front of the sanctuary is our beautiful stain glass cross. It was created by Tom Medicott who happens to be the brother in law of our own member, Sue Hammond. I had a wonderful discussion with Tom about this cross last week in preparation for today’s sermon. The cross is made of antique glass which is the most brilliant, hand-made glass there is. The cross comes to life when light is behind it. Tom wanted the cross to blend in with nature. The blue of the cross as the background blends into the infinity of space, into the blue skies. The rays of light emanate from the center or the heart of the cross. The ribbons and the rays represent the spreading of the Holy Spirit. The side lites were added to represent the continuity between the cross and nature. Tom did not want the cross limited by the frame; he wanted the heart of the cross to flow out from here to the universe. The Building committee is excited to announce that you will see more of Tom’s gorgeous art work appearing in the months ahead with the refurbishing of the atrium in Covenant Hall and the construction of Mosaic Hall. Perhaps what touched me the most about this construction of the cross is that Tom installed this cross on September 11th, 2001. He had put up the scaffolding the night before and the next morning, of course, we awoke to the news of planes flying into the World Trade Center. At first Tom wondered whether he should still come to install the cross that day. If you remember most of us were glued to our television sets. But Tom decided to come anyway to this sanctuary to install the cross – a symbol of healing and wholeness and love in the midst of unbelievable fragmentation, brokenness, destruction and pain. Powerful story behind this symbol in our sanctuary. Of course, I hope that this sanctuary may be a sacred space of healing and wholeness and love for all of us. The term sanctuary also means a place of safety. Legally, under English law, from the 4th to the 17th centuries, fugitives were formerly immune to arrest in sanctuaries. They were places of safety. Today, some cities offer sanctuary to refugees and undocumented immigrants. There are also animal sanctuaries and plant sanctuaries. The land on this property at 168 Bellevue Ave has been designated as a certified wildlife habitat, a certain kind of sanctuary where basic habitat elements are needed for wildlife to thrive. Again, we recognize that all land is holy and all beings are sacred. My prayer is that in this place you will find a space of safety – bringing all of who you are and all of who you are not to worship. In this sacred place may you find healing and wholeness and love. For the greatest treasure in this sanctuary are those sitting in the pews. You are the greatest treasure of this sanctuary. The Holy of Holies resides within you. In the words of the mystic Rabia, “In my soul there is a temple, a shrine, a mosque, a church that dissolve, that dissolve in God.” As you walk through the front doors of this church on Sunday mornings, may you find your soul dissolving in the arms of the Divine. Amen.